If I created a Fit-Pic for every time I saw powder skiing that I couldn't partake in, I think I'd rack up more posts on Fit-Ink in the winter months, especially when other works gets in the way and I abandon this site more often than I'd like. But then again, if you're not a skier, you hate snow and you despise cold weather, it's a good thing that I don't. Today, though, I couldn't help myself. There's snow outside my Chicago window--it's not much, but it's enough to remind me that it is still February and that I can't always run when I want to, wearing minimal layers (here I am 50-something days into my 2012 running season and I STILL have issues dressing appropriately) and hardly worrying about slipping on ice. And when I see snow, it makes me pine even more for skiing. I'd even take playing in the snow around here, but there's not enough for that to happen and if weather patterns prove correct, this snowy layer will be gone by tomorrow. But who says I can't stare at the above picture and wish that I could be at Arapahoe Basin--or Vail, Jackson Hole, Alta or Whistler for that matter--taking some powder shots like that one? With 16 inches in three days--A-Basin received another two inches to add to the nine inches it received overnight Thursday--and more expected over the weekend, I certainly wish I wasn't stuck behind my desk dreaming instead of doing. I guess I really can't complain too much--the pool is calling my name for a swim workout and a 5K, indoors to boot, is stealing my feet Sunday morning. Not the same as snow, but it'll do. Skiing this weekend? 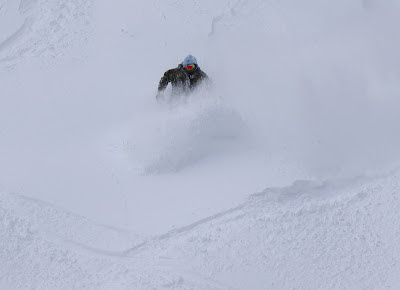 Where are you finding the powder? Share your spots so I can live vicariously through your adventures--not to beg, but it's my saving grace. Photo courtesy of Arapahoe Basin, Kimberly Trembearth, and taken at 9 a.m. Thursday, Feb. 23.